Every once in a while, while browsing in an antique shop, you may come across an antique cream separator. Many people don't know that they are, but they were once an important tool that would have been found in almost every country kitchen in years past. Before the cream separator was invented, the farmer would allow the milk to sit for a period of time until the cream rose to the top of the milk and could be skimmed off. This was a time-consuming process and increased the chances that the milk would be contaminated. The next separators that were produced were little more than a container with a nozzle at the bottom and a window in the side. The milk was put into the container and then allowed to stand for a period of time. This allowed the cream to rise to the top. Then the nozzle was opened and the milk drained off into another container. The person operating the nozzle could watch in the window to see when the milk was completely gone and only the cream was left. The centrifugal separator was first made by a man by the name of Gustaf de Laval. His product made it possible to separate the cream and milk quickly and easily, reducing the risk of spoilage or contaminants getting in the milk. He was not, however, the original inventor. There were several patents that were registered before his. It was his ability to get the products into the hands of the general population that associated his name with separators forever. How Does A Cream Separator Work? 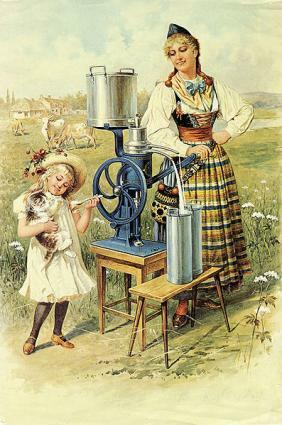 A cream separator was used to separate the cream from the milk after the milking was done. These machines used centrifugal force to send the cream and the milk to separate spouts where the flowed into their own containers. The person operating the separator, usually the farmer's wife or child, would turn a handle around and around. As it spun thousands of RPMs developed. This spun the container and caused the milk to be pulled against the walls of the separator while the cream, which was lighter, collected in the center. The separators came in a variety of sizes from small tabletop models for small farms to huge floor models for larger dairies. Since not many collectors are familiar with antique cream separators, it can be hard to tell if all the parts are there or not. Here is a list of basic parts that most of these machines will have. There were hundreds of models of cream separators made. They are generally pretty easy to find once you know what you are looking for. Whether you choose a tabletop version or a floor model will depend on your home, your decorating scheme, and the look you want to achieve. Most homes today are not going to have room for an antique cream separator that is four feet tall. If you live in the Midwest you may be lucky enough to find one in the attic or a neighbor's barn. Since this area of the country had a lot of dairy farms there are often at least a few separators at any garage sale you go to. Of course, antique shops are a great place to find these remnants of pioneer America. The cost of a cream separator can vary from two or three hundred dollars to twenty or thirty dollars, depending upon the size of the separator and whether or not all the original parts are included. The best thing to do is to get a feel for the price of separators in your area by looking and comparing them long before you purchase your first one. If you would like to learn more about separators and talk to people who are also collecting them you may want to join a chat board or collector's club. Cream Separator Gallery has numerous images as well as articles, a chat board, a for sale area, and other important information for the collector. Doug and Linda's Dairy Antique Site has helpful information and images for several types of dairy related antiques. Farm Collector has a wealth of information for people who collect old farming equipment including separators. It is interesting to look at and touch old farm tools and think about how they were used. To own one of them allows you to be the caretaker of a piece of history.